This fascinating series for animal lovers of all ages gives an incredible glimpse into life behind the scenes at Dublin Zoo. If you have missed a recient episode of the Zoo in RT� you can catch up online with the RT� Player. Why not visit the animals featured in The Zoo TV Series for your self at Dublin Zoo, for more information check out; Dublin Zoo. It’s back! A brand new series of The Zoo, proudly sponsored by EBS, will be returning to your screens on April 10th at 7pm on RT� One, and there are ten brand new episodes for you to enjoy! It's been several years since Dublin Zoo has had penguin chicks, but when a pair of healthy looking eggs are discovered by Eddie and his team in the penguin habitat, they make the difficult decision to hand-rear them and help them survive. Now fully grown, it’s time for the red panda cubs to leave home and find mates of their own. 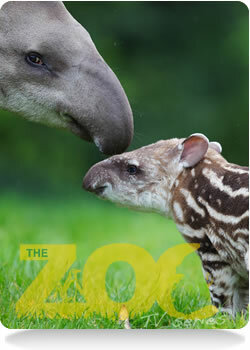 Susan travels to Fota Wildlife Park in Cork to help oversee the first introduction to a new mate. When a California sea lion pup is born mother and pup soon develop a close bond. Eddie and Garth keep a close eye on them as she introduces the young sea lion to water for the first time. A hand-reared gorilla joins the gorilla troop in the Gorilla Rainforest. It's going to be a long and careful process to have her introduced successfully to the other western lowland gorillas, but how will the rest of the troop react to the new arrival? In the meerkat habitat there's great excitement when new pups are born, and it isn’t long before they’re learning from their parents. Budi the young male elephant is growing bigger and stronger by the day, but when he begins to get too boisterous with the female elephants keepers are forced to make some difficult decisions. Meanwhile, a bull elephant arrives in Dublin Zoo, after a year of careful preparation by the keepers. The question is, how will the huge Asian elephant get on with his new herd? Brendan leaves Dublin Zoo for Borneo, to visit critically endangered orang-utans in the wild and discovers a whole new world of wildlife on the way.